“Toronto crime” is the the top search term that lands people on my blog, a blog about neighbourhoods and how we live together in community. However, as Mazlow’s hierarchy of need describes and, as our new local police superintendent must know, safety is the basis of all else. Crime, and the threat of it, is why we pack high school auditoriums and why we write worried letters-to-the-editor. Whether our reaction is to lock ourselves behind double-deadbolted doors or to set up Neighbourhood Watches, these are the ways we seek to protect ourselves and that which we love. Last summer I attended a nearby community meeting with the local crime prevention officer. The attendees, many of my better-off neighbours, fretted about activity in the back alleyways, apparent drug activity at some homes, and people with substance abuse problems wandering by on neighbourhood sidewalks. None of these made the neighbourhood very family-friendly, so this focus wasn’t unfounded. This is a neighbourhood where a substantial number of its residents have had some involvement with the criminal justice system, and the local police station has shown that targeting the few “bad apples” can drive down crime. Combing through a map of incarcerated individuals from a 2009 Toronto Star investigation, I found this part of the east end ranked on par with a few of the city’s better-known priority neighbourhood areas (see More below). I sat listening for a while, sympathetic to these women, protective too of their broods. But now my son, the teenager I love, has grown. He is taller than me with a bristly haircut, a loping walk, and arms he’ll flex at the merest provocation. He looks, admittedly, a bit scary to some. And, as a mixed-race kid, he doesn’t carry the skin privilege I do. Were they talking about him? A few assured me afterwards they didn’t mean him, of course, that they knew he was a good kid. But that’s small comfort. He has already been stopped by the Police, and I know the police won’t be asking my neighbours to vouch for him. So our crime prevention meeting abruptly became nerve-wracking. Suddenly we weren’t talking about criminal activity. We were talking about how people looked, or dressed, or ambled around the neighbourhood. We were ready to call the police when someone, muttering to themselves or holding “too much” cash, walked by our porch. This, in a former working class neighbourhood, still with a group home, a rooming house, public housing, and scattered supportive units for people with mental health challenges? Were we talking about enforcement over community-building? To sanction over supports? Perhaps if we are scared enough, I heard. This is the nub of the challenge our new superintendent will face: the tensions that arise among those who are different from each other, among those who do not have an easy understanding of each other and a code of behaviour to smooth things over. It will take a sharp mind and a good heart to negotiate these waters, but I’m sure she’s up for the job of catching criminals, of resolving local disputes, and, as they say, of knowing the difference between the two. 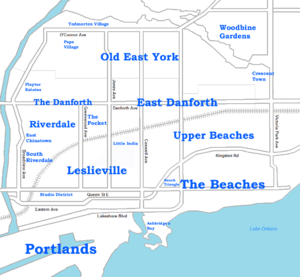 Do you know the names of Toronto 140 official neighbourhoods? Click that ‘hood tests your knowledge of officialdom, making a game of the City of Toronto’s administrative planning areas. Developed for Code for America by Matt Keoshkerian, a transplanted Torontonian, the website uses data now available through Open Toronto. In a Google world, Click the ‘hood cleverly avoids the perennial problem of double spellings between the spelling of neighbourhood and neighborhood. 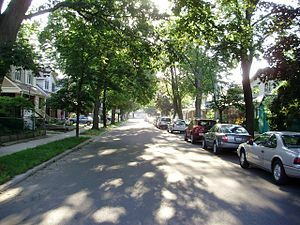 The site has gamified city neighbourhoods around the world, including Montreal (20 neighbourhoods), Vancouver (23 neighbourhoods), and Saskatoon (59 neighbourhoods). With the growth of mapping, neighbourhood names are facing a new revival. Sociologists argue the naming of a neighbourhood is an important marker of social cohesion. Condo developers know this well, too. Donmount public housing was subject to an entire re-branding when it became Rivertowne, and the neighbourhood around it as taken the name Riverside. My favourite recent example of this is the new development at the corner of Woodbine and Upper Gerrard within days of local residents voted to call their area Beach Hill, a name marketed by a local condo development. Most of these cities have geographic gaps, parts of the city where no common consensus has emerged on the name of the place. Even within Toronto this was a problem. Developed about ten years ago in an effort to coordinate competing geographic descriptors across various service divisions, City of Toronto staff divided the city into 140 areas. The areas were clustered to capture similar social demographics among residents and to be similar in population size. Natural boundaries, such as ravines and railways, were used where possible. Finally, neighbourhood names were selected, without broad consultation, on historic names or local geographic features, such as street names. Through this method, the entire city was mapped and, now, with the power of gamification, the City’s 140 administrative neighbourhoods will become more familiar to Toronto residents.